During the late ’60’s and early ’70’s, a number of technical papers in the field of highway safety indicated that reasonably accurate estimates of the speed-changes that occur in wide-contact collisions can be obtained through the use of simple linear relationships between the impact speed-change and the extent of residual crush (e.g., References 34, 50-52, 3). 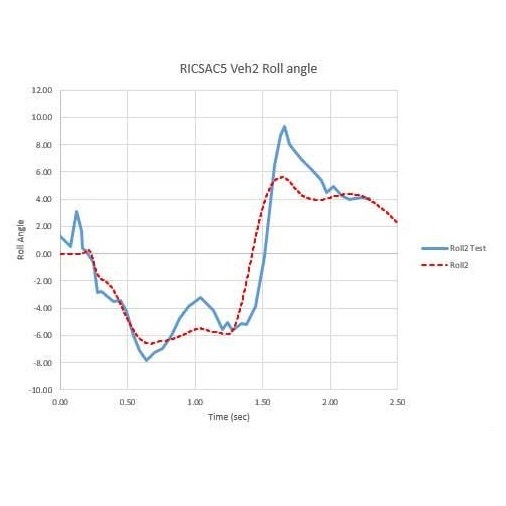 While such relationships obviously constitute a gross simplification of complex automobile structures, they were found to be capable of yielding impact speed-change results with approximately a plus or minus 10 percent accuracy when applied to a limited number of staged collisions (e.g., Reference 46). In a more comprehensive evaluation (e.g., Reference 53), it was found that the 95 percent confidence limits on individual calculations of delta-V ranged from 9 to 25 percent. When a damaged vehicle is examined, the damage observed is called the residual or permanent damage. This permanent damage observed is the result of a dynamic collision event. During the collision the vehicle normally deforms a certain amount greater than the observed final residual damage. The amount a vehicle initially deforms is called the peak or maximum dynamic crush. This period of the collision is also referred to as the period of deformation, which refers to the time from initial impact to the point of maximum deformation. 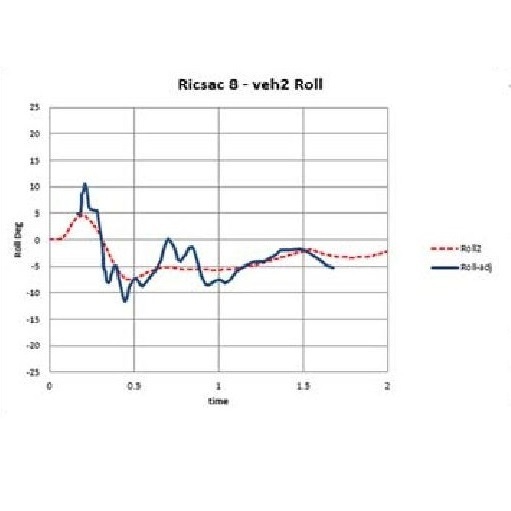 It is during this time that the maximum collision forces and resulting impulses act on the vehicles.Subsequent to the peak dynamic deformation, the vehicle begins the restitution phase. The restitution phase is the time from the maximum deformation condition to the instant at which the bodies separate. During this period additional forces and therefore an additional impulse acts on the vehicles as some of the structure restores or springs back. 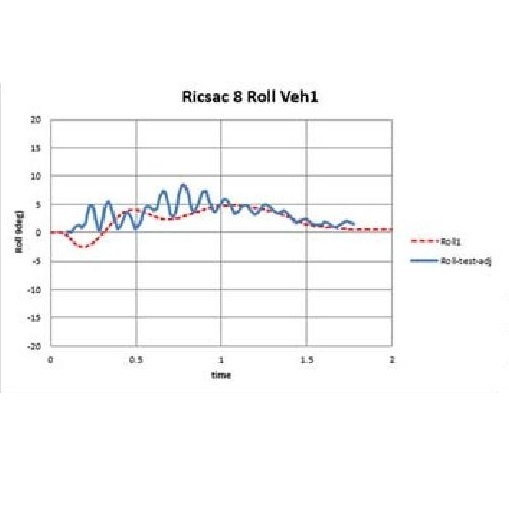 The rate, both in terms of force level and duration, at which the vehicle structure restores from the peak dynamic damage to the final residual damage determines the amount of additional impulse the vehicle undergoes during the restitution phase. 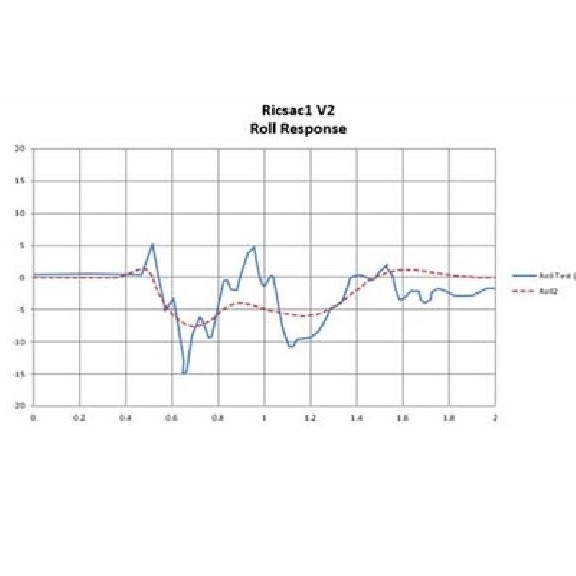 The restitution phase acts to increase the accident severity by prolonging the acceleration exposure while reducing the amount of residual damage. 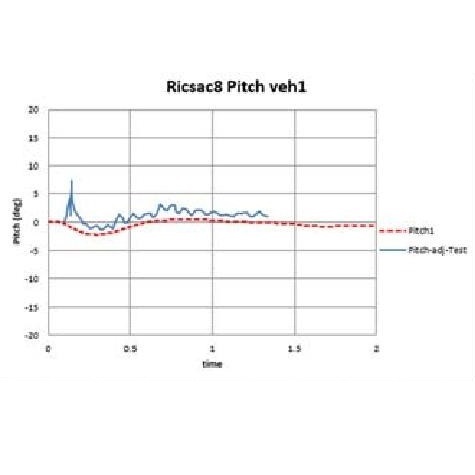 This accounts for an inherent error in the simplifying assumptions of a damage analysis procedure which ignores the restitution phase of a collision. 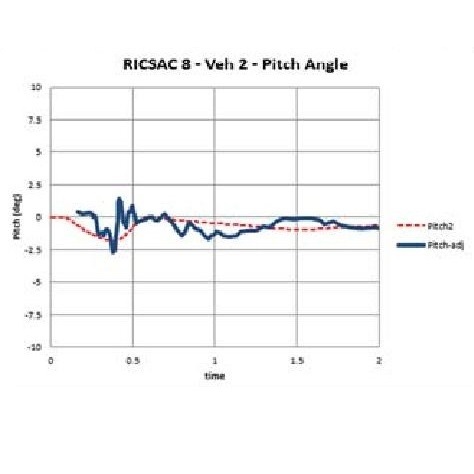 For a given amount of residual crush, the amount of restitution and the rate at which a vehicle restitutes can produce a range of variation of collision severity between different vehicles. 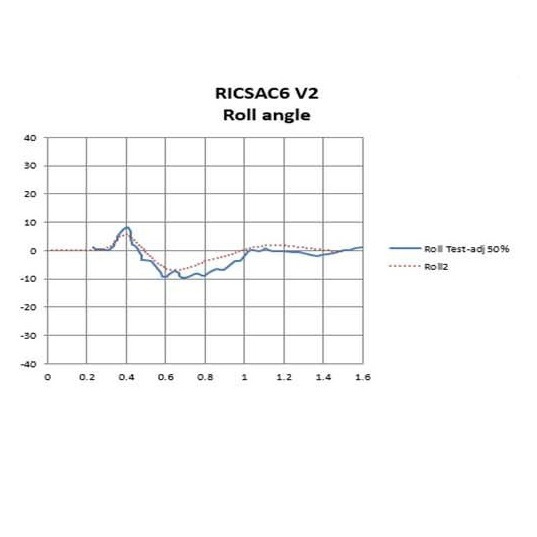 The magnitudes of the increases in the total speed change (using the proposed CRASH4 damage analysis algorithm of Reference 26 and including a range of hypothetical restitution properties) over the impact speed-change for the approach period only (using the original CRASH3 algorithm with it’s assumption of no restitution) were demonstrated in Reference 26 to range from 3.9% to 15.5% at 30 inches of static crush and from8.9% to 58.2% at 10 inches of static crush. 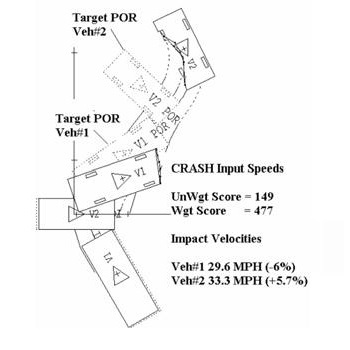 In 1987, a proposed revision to the damage analysis procedure for the CRASH computer Program was presented (Reference 26). 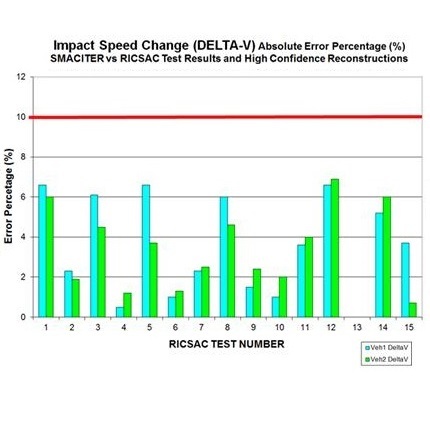 In the paper it was noted that Smith and Noga (Reference 47) properly conclude that the damage algorithm of the CRASH computer program tends to underestimate low delta-V values as a result of the neglect of restitution effects. 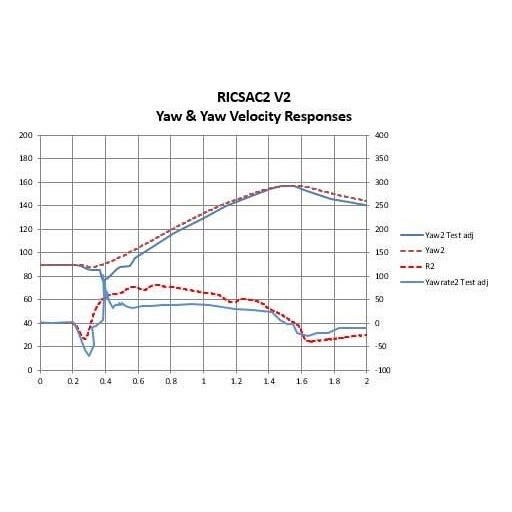 The original formulation of the CRASH3 program(References 48, 49) only addressed the speed change(Delta-V) up to the point of common velocity. 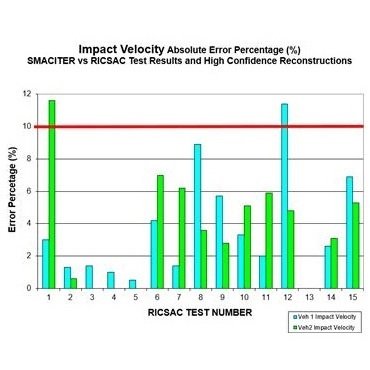 The omission of restitution effects in CRASH was based on several important considerations: First,the original formulation of CRASH had limited objectives in terms of accuracy: It was developed primarily as a pre-processor for use with the SMAC collision reconstruction program (Reference 1). Second, at the time of the CRASH formulation (1975), restitution effects of vehicle structures were not found to be sufficiently well defined to support the added complexity of inclusion of a provision to model restitution.The simplifying assumptions which included the neglect of restitution was clearly pointed out in the original Crash documentation (References 48, 49). 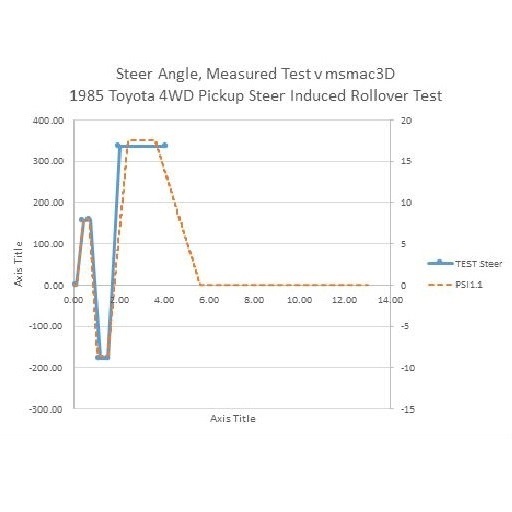 To date (1995) there has been no significant number of crash tests performed which include an investigation of the restitution properties of vehicle structures. Therefore there is too limited an amount of data available to include directly the effects of restitution in the CRASH type of analysis. 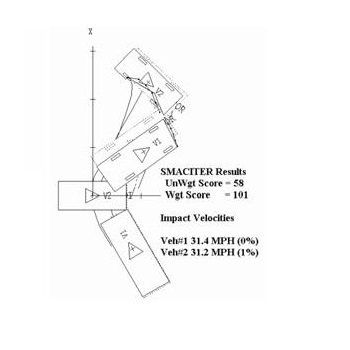 However, any reconstruction which utilizes a CRASH3 based damage analysis procedure should add to the predicted speed change a variable of approximately +10% at 30 inches of residual crush to +25% at 10 inches of residual crush for the predicted total speed change. 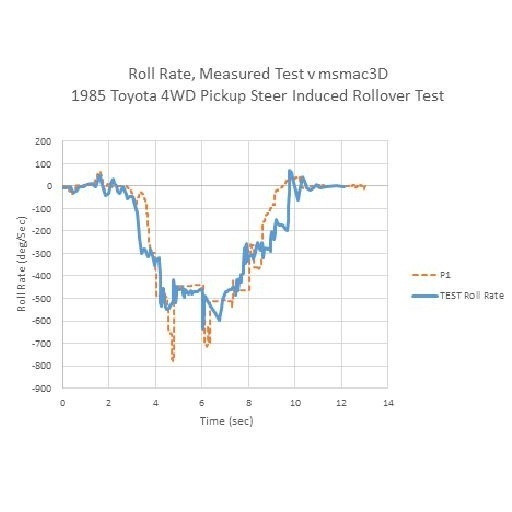 Papers authored by Prasad (References 36-40) as a part of the NHTSA investigation and refinement of collision reconstruction techniques discuss a CRASH3 “reformulation,” “new algorithm” and “new model” based on the results of the significant number of crash tests of late model vehicles. Abandonment of A, B and G.
The first two items have already been proposed or adopted by researchers and/or entrepreneurs in the field (e.g., References 41-45) and, therefore, they are not new concepts. The first item clearly should be adopted in a needed update of the existing CRASH3 coefficients(see discussion). The last item is an arbitrary, conceptual revision which cannot improve accuracy (see Reference 36, p.17, 2nd paragraph). 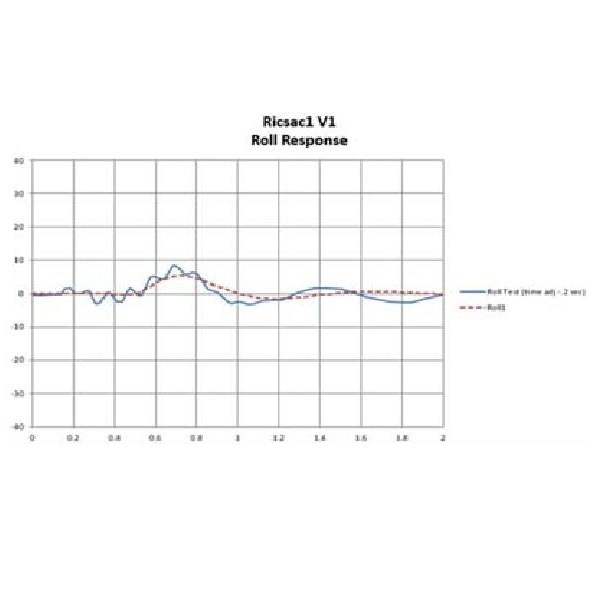 If a straight line is fitted through a clustered group of data points for delta-V versus the uniform or average value of residual crush (for known contact widths) that are all in the range of 30 to 35 MPH, the delta-V intercept at zero residual crush will clearly not be reliable. 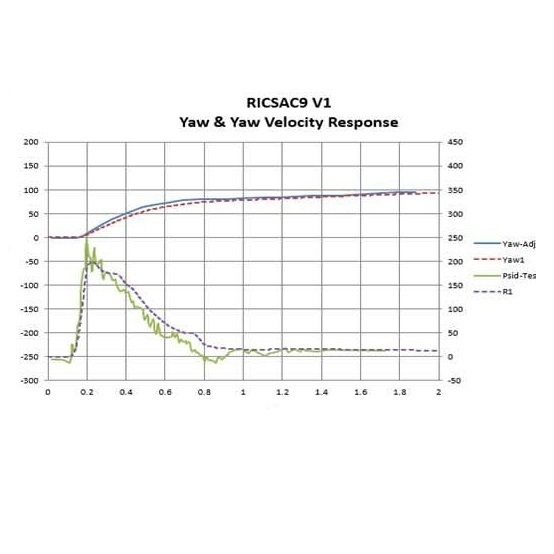 Therefore, in the case where actual data from low speed collisions are not available, a forced intercept will be preferable to an unreliable one based on the slope of a linear fit through closely spaced,relatively high-speed points. This conclusion has been reached in a number of related publications (e.g., References 41 and 43) and, therefore, it is not a new concept. Among the three topics addressed in the subject report, this one should clearly receive early attention in a needed update of the existing CRASH3 coefficients.However, such an update must not be based on single data points combined with the forced intercepts. 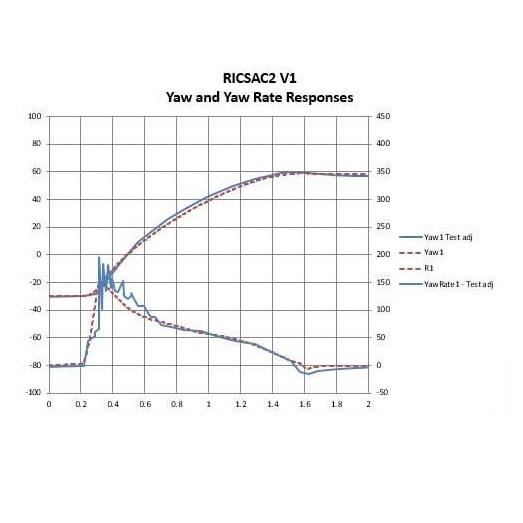 While the concept of a forced intercept may be accepted as a necessity with existing data limitations, the related use of real data points must include all available test results. Note that some individuals have based linear fits on single data points, combined with forced intercept.In fact, that appears to be the approach taken in Reference 36. 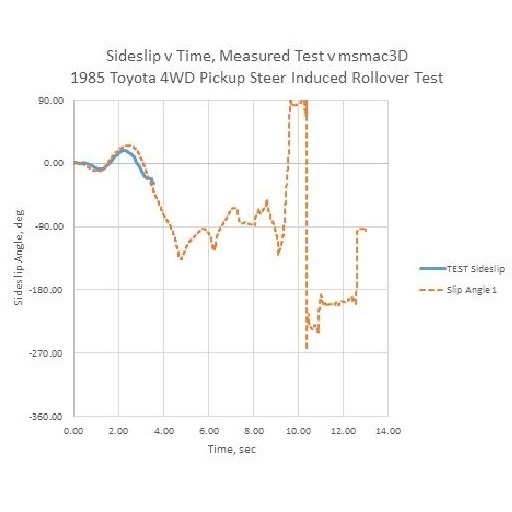 A judicious engineering approach to the empirical fitting process will clearly require the use of more than one actual data point for a given collision direction on a given vehicle. 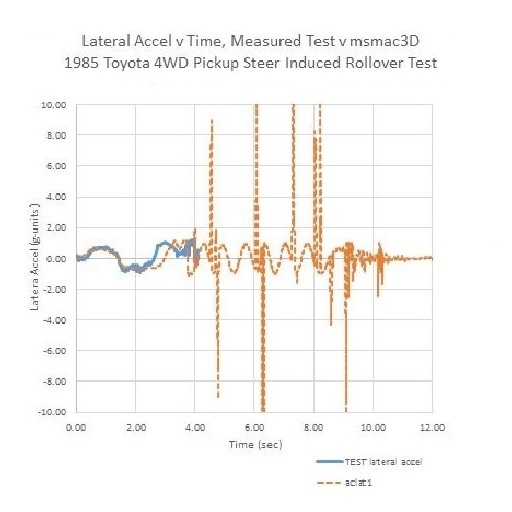 The scatter that occurs in crash test data makes the use of a single test result, combined with a forced intercept, a highly unreliable basis for a linear fit. 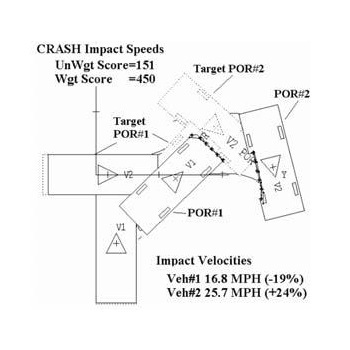 It is obvious that custom-fitted crush coefficients can generally yield more accurate damage interpretations than those coefficients based on fits by vehicle categories (particularly for the crash test on which they are based) (Reference 36: p.20, paragraphs3&4, p. 23, paragraph 4, p. 24, paragraph 1). References 43, 44, and 45 make that point in relation to the reconstruction of”specific collisions” (i.e., litigated matters). Unfortunately,the concept may not be applicable to NASS because of limitations in available crash test data and practical considerations regarding the storage of individual crush properties for the entire US population. 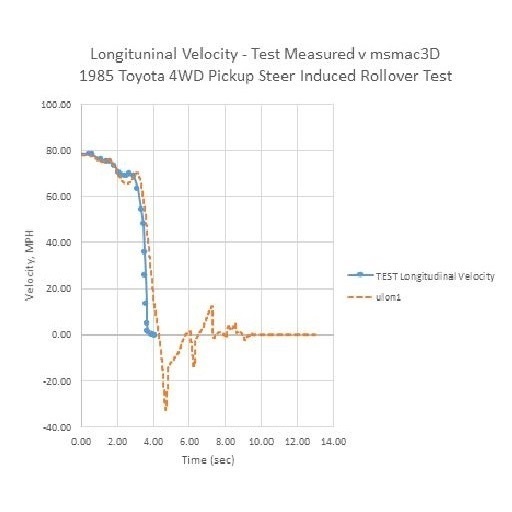 In the original CRASH approach, absorbed energy was selected as the basis for fitting empirical crush coefficients, in recognition of the fact that the test weights of a given makes and models of vehicle are generally not identical in available test data (e.g., empty vehicle vs. four test dummies). Also, the CRASH technique was designed to not be limited to uniform crush, central collisions against fixed barriers (e.g., Reference 46). Thus,while the crush properties are assumed to be the same in different tests of a make and model of vehicle, the extent of crush must be related to the actual energy absorption rather than to speed-change alone (e.g., effective mass in oblique collisions, irregular damage profiles, actual test weights). By way of explaining the physical significance of the fitted coefficients,it was pointed out that the assumption of linearity between delta-V and residual crush would necessarily imply a linear relationship between the crush resistance force per unit width and the residual crush(e.g., see Reference 46). This must be recognized as a “virtual” relationship since it is obvious that the resistance force and the residual crush do not exist simultaneously,except for the special case of a purely plastic collision. 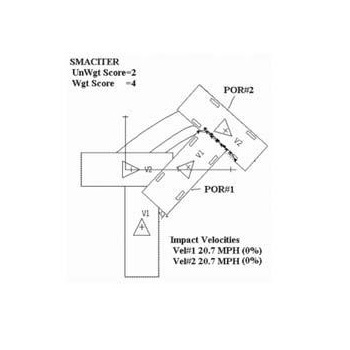 The authors of the subject report agree that, in the absence of evidence of “velocity sensitivity,” a linear force deflection characteristic is “the only shape which will result in a linear velocity deflection”(Reference 36, p.4 and Appendix F). 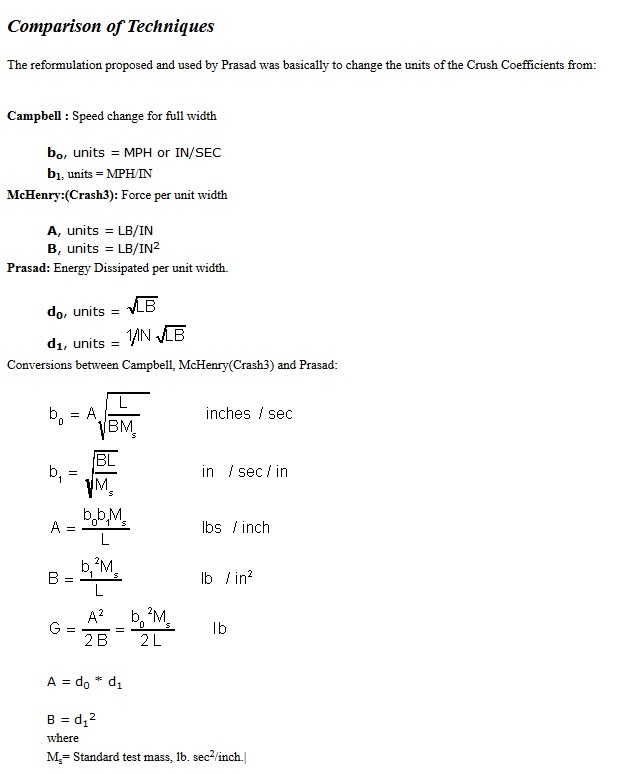 Further, they adopt a linear velocity deflection relationship (Reference 36, p.2, paragraph 3, p.13, paragraph 2). 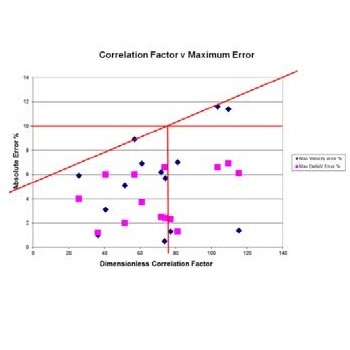 Thus, the only basis for rejection of A, B and G, other than “conceptual complication,”is their failure to find a sufficiently linear force deflection characteristic in indirect measures based on test data which are inconsistent with each other (see Figure 2.5 and 3.1 from Reference 36). 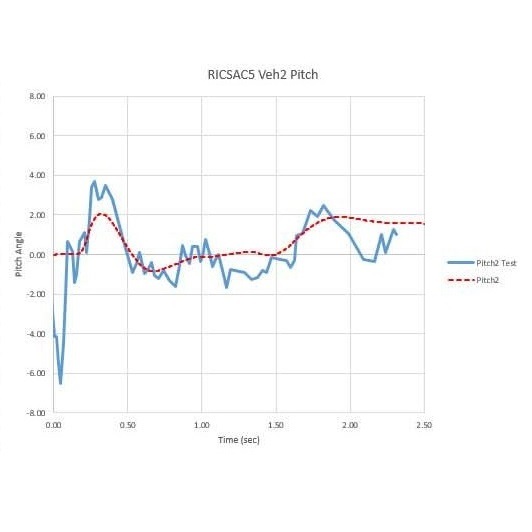 The force deflection curves presented in Reference 36, Volume II are based on double integrated “best accelerometer”data for dynamic crush, combined with summed load cell data for force. (Note that no mention is made of corrections for pitch responses. )The erratic nature of the plots suggests instrumentation difficulties and/or interpretation errors. For example, the “dynamic displacement” indicates full recovery in some cases (e.g., tests 119, 297, 633 from Reference 36) and negligible recovery in others (e.g., Tests 18, 334, 448 from Reference 36). Some force vs. displacement plots show no forces at large displacements (e.g., Tests 415, 425, 426 & 427 from Reference 36) while others start with large forces at zero dynamic crush (e.g.,Tests 466, 467, 575, from Reference 36). Thus,the interpretations of test data are considered to have doubtful validity. 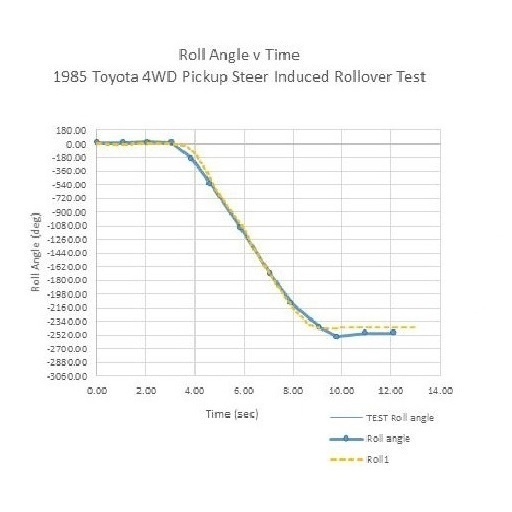 This brief review of the CRASH damage analysis algorithm and the NHTSA ‘reformulation’ by Prasad indicates that the ‘reformulation’ consists mainly of the addition of new crash test data points (which one might only consider ‘new data’) and the use of different symbols in the CRASH formulas. All the simplifying assumptions of CRASH are retained and no additional refinements have been introduced.